This story tells of a journey into "The Magic Flute" opera with all the plot and action of a great old-time radio drama. A young girl finds herself in the fairy-tale world of Mozart’s "Magic Flute." With a talking dragon as her guide, Sarah helps the prince find his princess. 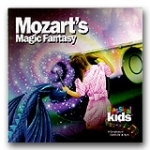 Features Mozart’s best-known arias, freshly recorded with child-appropriate verse. We are out of all CDs of this title. The only thing we have left is 1 Teacher Guide. The Dream Children are about to be written out of Mozart’s most famous opera. In the hopes of changing their fate, they enlist the help of the composers young son Karl. Together the children embark on an incredible journey that takes them back in time to Mozart’s childhood and far ahead into the future. 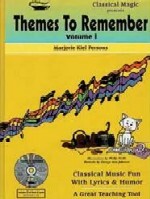 Along the way, Karl learns much about his father and comes to understand the great composers legacy of timeless music.